Note: Those interested in 16th century Irish clothing may also be interested in my class notes for a Broad Introduction to 16th Century Irish Attire (male and female, all social classes), my 2014 Irish-style Fencing Jacket Project, and my 2015 16th Century Irish Onion Hat Project. For the reign of Gabriel II and Constanzia II of Lochac, I was admitted to the King’s Livery Companie. This required me to work on an A&S or service based activity, to be reported on at Their Divestiture. 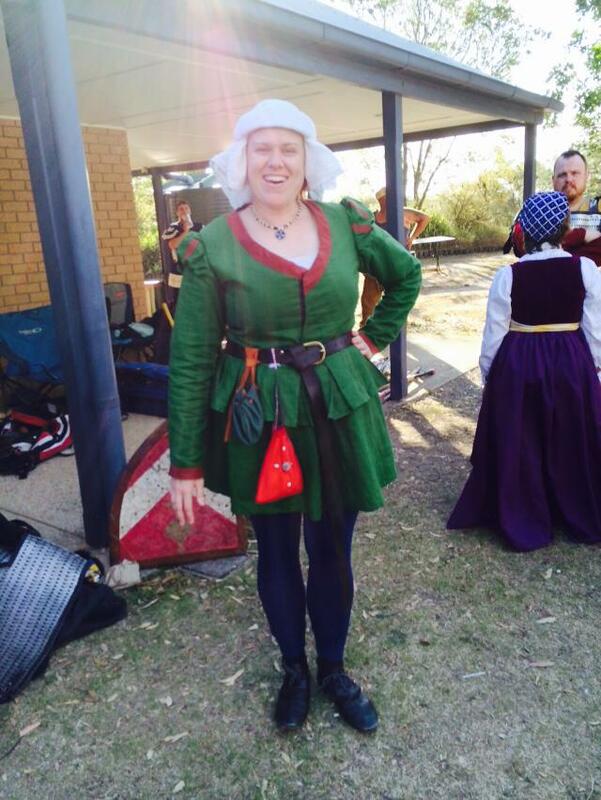 As a part of the Livery Companie of His Majesty Gabriel II, I researched, constructed and taught others about 16th century Irish women’s attire. I chose this project because my SCA name, Ceara Shionnach, is an Irish Gaelic name and my persona is from the 16th century Ireland. Also, my household, Burbage House, is 16th century English. I tend to prefer 16th century attire as a whole. The full project submitted at the Divestiture event can be downloaded here: An Exploration of 16th Century Irish Women’s Attire (pdf). In the 16th century, England continually tried to control the Irish. King Henry VIII declared that he was King of Ireland and both he and Queen Elizabeth I enacted laws to control even the very dress of the Irish. The fact that these laws had to be repeated through several proclamations suggests that the Irish were not so easily dissuaded from their own culture. Throughout the medieval period, Ireland was divided into dozens of kingdoms that were inherited through the male line. Contemporary literature suggests that some Irish nobles, such as many of the powerful Butler and Fitzgerald families, submitted to English rule to keep their land and power and adopted English and French fashions to show this. Conversely there were several Irish nobles who disliked, or refused, to wear English clothes, even when Queen Elizabeth I herself gifted them. Clothes then, became a symbol of Irish national identity. I believe that this turbulent political dynamic resulted in three apparent streams of clothing choice in Ireland: those who wore English and other popular European, non-Irish fashions to appease the self-imposed English ‘sovereigns’, those who wore Irish fashions at home and English fashions in public gatherings to avoid conflict, and those who continued to wear Irish clothing exclusively to symbolize their refusal to submit to the English. Unfortunately, there are not large numbers of extant items or garments that have survived from 16th century Ireland. This is, in part, due to the acidic bogs and soils of Ireland that break down fabrics and organic matter. I identified four main sources of information that can be used to extrapolate the clothing worn in 16th century Ireland: Stone effigies, contemporary descriptive literature, drawings and woodcuts. 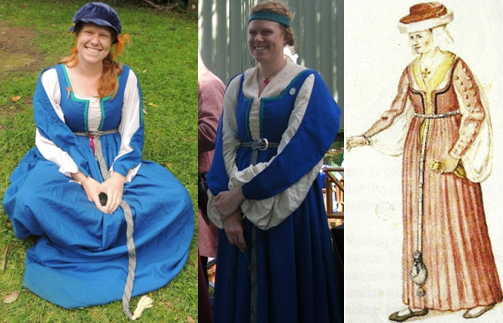 I found examples of these four source types and assembled a collection of resources to illustrate female attire in 16th century Ireland. I made an attempt at two outfits based around ‘Civil Irish’ (i.e. middle class Irish) to suit my persona. A silk girdle that hung around a high waist, ending in a tassel near the hem and with a pouch attached above the tassel. As part of my project I sumarised my research to date and held a discussion at Great Northern War 2011. The notes can be downloaded here: An Overview of 16th Century Irish Women’s Attire (pdf). Note: The items I made, depicted below, are detailed in the full project (downloadable at the link at the top of the page). Left: My first Irish outfit, made entirely of linen. Right: A watercolour of an Irish maid by Lucas de Heere (1575). Two left images: Ceara’s second Irish dress. Right: Watercolour of an Irish woman by Lucas de Heere (16th century). 2 top left: Lucas de Heere, 1575. 2nd right: Ceara made a pewter pendant. Far right: Ceara made glass beads to accompany the pendant (glass love heart a gift from Master Sui Zo). Left and middle: Bog green, knee-high socks in the process of being knitted by Ceara. Left: Ceara’s ‘cheese mould’ hat. Right: Watercolour by Lucas de Heere of an Irishwoman (1575). In November 2014, I finished constructing a new fencing jacket in a style evident in John Derrick’s Image of Ireland: see more information on my blog post Fencing Jacket – 16th Century Irish Style. Me, wearing my new jacket for the first time at the Battle of Bottony Cross in the Barony of St Florian de la Riviere. Photo by Iglesia Delamere, October 2014. Note: The full reference list is available in the full project (downloadable at the link at the top of the page). * Duffy, Sean (editor, 2005). Medieval Ireland, An Encyclopedia. Routledge, New York and London. Pp8, 114, 251-254. * Dunlevy, Mairead (1989). Dress in Ireland: A History. The Collins Press. Pp 27-90. * McClintock, H.F. (1950). Old Irish and Highland Dress. Dundalgan Press. Pp 30-118. * Rae, Edwin C. (1971). Irish Sepulchral Monuments of the Later Middle Ages. Part II of the O’Tunney Atelier. The Journal of the Royal Society of Antiquities of Ireland, Vol. 101, No. 1, Pp 25-28. http://www.jstor.org, accessed 2011. * Walker, Joseph C. (1788). An Historical Essay on the Dress of the Ancient and Modern Irish. Printed in Dublin. http://books.google.com, accessed 2011. Just found your blog. Thanks for the inspiration and the resources! Nice piece. However, I would like to make a few points. None of the effigies reflect Gaelic clothing. They are of English or Norman families. The léine, as worn by men was not pleated up to the neck. There is no evidence for such a statement. What you see from manuscripts, such as the Book of Kells reflect a religious garb and not the clothing of the people. 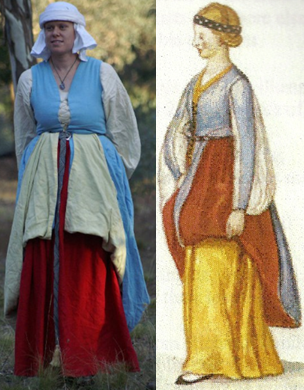 All evidence from the 16th century indicates a léine that is not pleated up to the neck. As an everyday wearer of the léine, I should know. Also, the brat was semi-circular and not rectangular. Curator, Ballyshannon Museum, Co Donegal, Ireland. Thank you so much for your input! I intend on updating this information and making it more easily accessible at some point so I will incorporate your corrections in to that. The two books that you mention are the best sources out there. Fortunately, I am based in Ireland and have more contacts and visit the National Museum to see actual finds. Further, I think that closer inspection of what is available can reveal more information. An example of this would be looking at the available images such as De Heere and trying to accurately reproduce them. There are folks out there who make up their own léinte and bratannach and sometimes I wonder if they really looked at the original images. Google Irish léine for example and see for your self. None of them can get the sleeves right. They all insist on having the sleeve opening to the outside of the sleeve when it was clearly opened at front. I regularly give lectures on Irish clothing and wear the clothes daily. Finally, I am writing a book on Irish clothing but it will be two or three years away from publication.